With Good Friday around the corner, this may be the last chance (for a long while, anyway) to sample the weekly Lent specials we offer! It may be next year before you can get your hands on our fish & chips, something that customers beg us to put on the menu every day of the week! 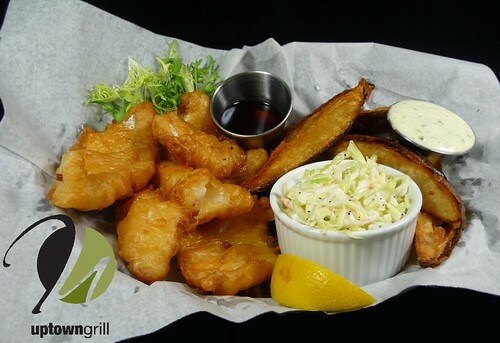 Served with house made coleslaw and fresh cut "chips," our fish is fried with a beer batter to give the authentic English touch. This will also be the final day for locally made, hand-rolled spinach filled tortellacci with a white wine cream sauce. Delivered to us weekly, these tortellacci are made here in LaSalle and allow us to help support local businesses as others do for us. Our final Lent special is the 10 oz. orange roughy filet baked with spinach, baby zucchini, baby carrots and roasted red potatoes in parchment paper with a lemon tarragon sauce. This mild textured and medium flavored fish is baked in a parchment bag with a light sauce to retain it's natural flavor and moisture. While these may be the last few days to get your hands on our lent specials it also is the beginning of some of our Easter specials! Serving all day Easter Sunday, we will have our traditional Prime Rib, Roasted Boneless Pork Loin and Leg of Lamb available all day rather than just Friday and Saturday Night. While we will have these classic dishes, we will also have a variety of seafood, pasta, and salads that are our twists on traditional dishes. Additionally we will also be serving off of our everyday menu to ensure that everyone can find something that they'll be sure to love! While walk-ins are always accepted, make sure to reserve a table for you and your family. Call for reservations: 224-4545.